I don't know why I'm starting this post as if it were a letter. o.O Anyways. This week I am bringing to you a quote game, but it's of a different sort than they usually are. This time I'm going to throw a bunch of random quotes at you--well, not random, exactly, all of them are connected to Jane Austen--and you have to point out which ones don't come from P&P95. If you can, you should also say what they are actually from. So. You'll get one point each time you point out a quote that isn't from P&P95--but, here's the catch, you'll get one taken away if you say something isn't from P&P95 that is. You'll also get one point each time you correctly name what the non-P&P95 quotes are from. (It could be the book, another version of P&P, or another Jane Austen adaptation altogether.) You can tell who said what if you like, but you won't get any points for it, I'm afraid. 1. "What does she mean by scampering about the country because her sister has a cold?" 2. "Affection is desirable. Money is absolutely indispensable." 3. "With Father's estate entailed away from the female line, we have little but our charms to recommend us." 4. "What care I for colds when there is such a man?" 5. "Oh, your father may spare you if your mother can; daughters are never of much consequence to a father." 6. "What are men to rocks and mountains?" 7. "Count your blessings, Lizzy. If he liked you, you'd have to talk to him." 8. 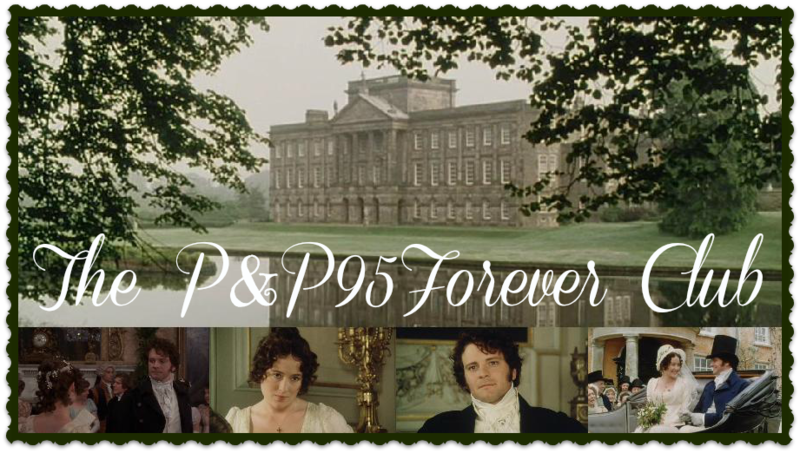 "Well, we're hoping Elizabeth can manage to catch a cold of her own and stay long enough to get engaged to Mr. Darcy. Then, if a good snowstorm could be arranged, we'd send Kitty over. But if a young man should happen to be in the house - a young man who likes singing, of course, who can discuss philosophy - Mary could go. Then, if a dashing young soldier in a handsome uniform should appear for Lydia, everything would be perfect, my dear." 9. "How good it was in you, my dear Mr. Bennet! But I knew I should persuade you at last." 10. "I wish, Miss Bennet, that you would not attempt to sketch my character at the present moment. I fear the performance would reflect no credit on either of us." 11. "Look at them! Five of them without dowries. What's to become of them?" "Yes, what's to become of the wretched creatures? Perhaps we should have drowned some of them at birth." 12. "It's been my experience, that an event looked forward to with much impatient desire, does not always brings its promised satisfaction." 13. "And I hope you will pay Mr Collins every courtesy tonight, because he has been very attentive to you!" 14. "How pleasant it is to spend an evening in this way! I declare after all there is no enjoyment like reading! How much sooner one tires of any thing than of a book!" 16. "You make me feel quite envious. I have no brothers at all, only four sisters." 17. "That man is so full of himself, I'm surprised he can stay on that horse." 18. "And even Mr Darcy, you know, may improve on closer acquaintance." 20. "Well, my dear, if this be the case, he deserves you. I could not have parted with you to anyone less worthy, Lizzy." 7. no, possibly the fake P&P? 8. No? from the fake P&P? OOOOOOOOOOH! This looks like FUN! Not that the other games don't. Heehee. But this one is especially so. 6. The Book. I'm pretty sure this line never appears in The Real Version, though a mangling of it does show up in Fake P&P. 8. I'm gonna throw out a guess and say this is P&P40. 11. Hahahah same as 8. The end. I hope I did not utterly disgrace myself. Heh. 6. Not from P&P95 - from P&P the book? 17. Not from P&P - from "Emma"
- The atrocity, 2005 version of P&P. - I have no idea what this is, but it's very amusing. - I think this is also the 2005 P&P. - Oh, this is very similar to the book, but this appears to be altered into a direct quote from Lizzy, which I don't remember in the P&P95 or the atrocity. I'm very interested to find out what this one is! - This is a direct quote from the novel. - Hmm, I think this might be 2005 P&P also.